This is our go-to recipe for every Rutgers game because it is so tasty! Even using premade pizza crust and canned marinara sauce, this is a little bit more work than usual, but leads to delicious results. On two jelly roll pans, unroll the pizza crusts, stretching into a rectangle about 10"x15". You'll be doing each assembly step twice, once for each dough rectangle. Brush dough with melted butter, setting aside any unused for later, then sprinkle the garlic ontop, leaving a 1" border around the edges. Set aside 1/3 cup Parmesan for topping. Spread remaining Parmesan on the dough. 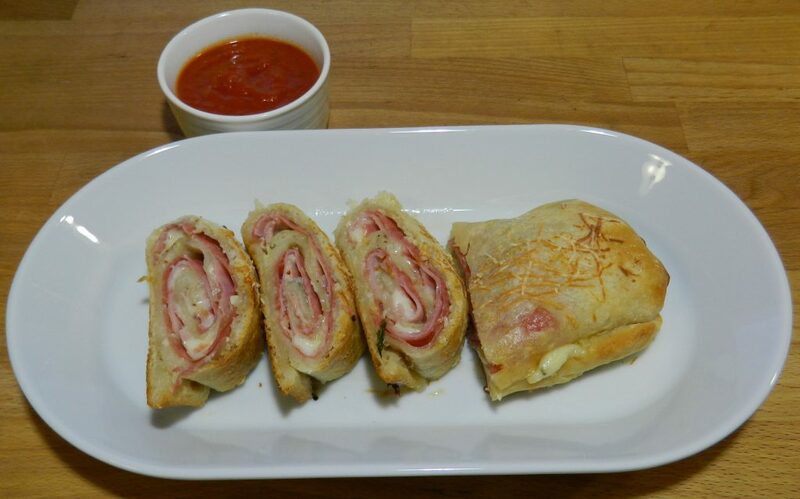 Repeat for second stromboli. With the long side in front of you, begin layering the filling with salami, then ham and prosciutto. Follow with the cheese slices. Sprinkle with basil and black pepper. Repeat for second stromboli. Now start to roll up the stromboli into a log shape, sealing the edges as you roll. At the far edge, seal across the entire side, then place sealed side down. Now move the second stromboli to the same sheet pan as the first one. Brush tops of stromboli with melted butter, top with reserved 1/3 cup Parmesan. Bake for 25-30 minutes, until top is golden. Remove from oven and cool for 5 minutes. Warm marinara sauce on stovetop. Cut into thick slices and serve with warm marinara sauce. 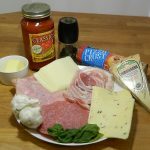 Customize your stromboli with your favorite meats and cheeses, or fill with vegetables and cheeses for a vegetarian version. Using the tube of pizza dough yields a thinner crust than frozen pizza/bread dough, but the refrigerated dough was much easier to work with.